Thanks to Crystal Anderson for permission to use her photo of two handsome-but-sleepy brothers, both Cree speakers-in-training. WUN nis kaa, WUN nis kaa! Click here for more songs for kids! Dawn Marie Marchand, 2012: Things to Pass On. Thanks to Solomon Ratt for adding audio to help with pronunciation! otôtêmiwêwin (4) - friendship - ᐅᑑᑌᒥᐍᐏᐣ Dawn Marie Marchand, 2012: Things to Pass On. otôtêmiwêwin (3) - friendship - ᐅᑑᑌᒥᐍᐏᐣ Dawn Marie Marchand, 2012: Things to Pass On. otôtêmiwêwin (2) - friendship - ᐅᑑᑌᒥᐍᐏᐣ Dawn Marie Marchand, 2012: Things to Pass On. otôtêmiwêwin (1) - friendship - ᐅᑑᑌᒥᐍᐏᐣ Dawn Marie Marchand, 2012: Things to Pass On. manatisiwin ekwa Manahcihitowin - respect for oneself and others - ᒪᓇᑎᓯᐏᐣ ᐁᑿ ᒪᓇᐦᒋᐦᐃᑐᐏᐣ Dawn Marie Marchand, 2012: Things to Pass On. kiskinwahasimowêwin - accepting guidance - ᑭᐢᑭᐣᐘᐦᐊᓯᒧᐍᐏᐣ Dawn Marie Marchand, 2012: Things to Pass On. kiskanowapâkêwin - keen sense of observation - ᑭᐢᑲᓄᐘᐸᑫᐏᐣ Dawn Marie Marchand, 2012: Things to Pass On. miyo-wîcêhôtowin- getting along - ᒥᔪ ᐑᒉᐦᐆᑐᐏᐣ Dawn Marie Marchand, 2012: Things to Pass On. okihtowihiwewin - generosity - ᐅᑭᐦᑐᐏᐦᐃᐍᐏᐣ Dawn Marie Marchand, 2012: Things to Pass On. kisêwâtisiwin - loving kindness - ᑭᓭᐚᑎᓯᐏᐣ Dawn Marie Marchand, 2012: Things to Pass On. mâmawohkamâtowin - working together - ᒫᒪᐓᐦᑲᒫᑐᐏᐣ Dawn Marie Marchand, 2012: Things to Pass On. wâhkôhtowin - kinship - ᐚᐦᑰᐦᑐᐏᐣ Dawn Marie Marchand, 2012: Things to Pass On. wicihitowin - sharing - ᐑᒋᐦᐃᑐᐏᐣ Dawn Marie Marchand, 2012: Things to Pass On. Darren Okemaysim translated this familiar, yet anonymous, text into Cree in 2013, before we were able to provide syllabics or audio. Since we’ve got a chance to update it now, perhaps we’d better take it! Thanks to Solomon Ratt for providing audio to accompany Darren’s text, and Rusty Gardiner’s photo of a morning reflection at Duck Lake. êkosi, sakihik êkonik kwayask ka-paminiskik, êkwa kiyâm êkonik êkây kâ-miyo-itôtâskik. So, love the people who treat you right and forget about the ones who don’t. This presentation by Solomon Ratt is equal parts dialogue-style text, and land-based tutorial. Scroll way down for a read-along video with more photos). For those who like to take their time with the text, a table is also provided, so you can also try the click-in-text lookup tool (start it by clicking the ᓀ at the left margin, then choose your language combination). While Sol uses the word sîwâkamisikan for ‘birch syrup’ here, others may use the word waskwayâpoy. tânisi mâna kâ-itahkamikisiyan ispîhk kâ-sîkwahk? nikî-sâh-sîwâkamisikânân mâna ispîhk kâ-sîkwahk. ᑖᓂᓯ ᒫᓇ ᑳ ᐃᑕᐦᑲᒥᑭᓯᔭᐣ ᐃᐢᐲᕽ ᑳ ᓰᑿᕽ? ᓂᑮ ᓵᐦ ᓰᐚᑲᒥᓯᑳᓈᐣ ᒫᓇ ᐃᐢᐲᕽ ᑳ ᓰᑿᕽ᙮ What do you do when it is spring? We made birch syrup when it was spring. ᑭᒋᐦᑫᔨᐦᑌᐣ ᒌ ᑕ ᓵᐦ ᓰᐚᑲᒥᑭᓯᔭᐣ? ᐋᐦᐊ, ᓂᒋᐦᑫᔨᐦᑌᐣ ᑕ ᓵᐦ ᓰᐚᑲᒥᓯᑭᔮᕽ᙮ Do you like to make birch syrup? I liked for us to make birch syrup. tânitahto kîsikâw ispîhk kâ-nâh-nitawi-sîwâkamisikiyan? tânisi kâ-kî-itahkamikisiyan? pêyakwâw ê-niyânano-kîsikâk nikî-pôsinân opahkopîwinihk isi, êkotê ê-kî-nitawi-mânokiyâhk ta-sîwâkamisikiyâhk. ᑖᓂᑕᐦᑐ ᑮᓯᑳᐤ ᐃᐢᐲᕽ ᑳ ᓈᐦ ᓂᑕᐏ ᓰᐚᑲᒥᓯᑭᔭᐣ? ᑖᓂᓯ ᑳ ᑮ ᐃᑕᐦᑲᒥᑭᓯᔭᐣ? What day did you do the activity? What did you do? One Friday we embarked (by canoe) to The Wading Place to set up a tent to make birch syrup there. nikî-mâh-mîstasonân waskwayak. pihcipacikan êkota nikî-astânân êkwa sîpâ pihcipacikanihk nikî-ahyânanak askihkosok ikota ta-isi-ohcikawik waskwayâpoy. ᑖᓂᓯ ᑳ ᑮ ᐃᑕᐦᑲᒥᑭᓯᔭᐣ? ᓂᑮ ᒫᐦ ᒦᐢᑕᓱᓈᐣ ᐘᐢᑿᔭᐠ᙮ ᐱᐦᒋᐸᒋᑲᐣ ᐁᑯᑕ ᓂᑮ ᐊᐢᑖᓈᐣ ᐁᑿ ᓰᐹ ᐱᐦᒋᐸᒋᑲᓂᕽ ᓂᑮ ᐊᐦᔮᓇᓇᐠ ᐊᐢᑭᐦᑯᓱᐠ ᐃᑯᑕ ᑕ ᐃᓯ ᐅᐦᒋᑲᐏᐠ ᐘᐢᑿᔮᐳᕀ᙮ What did you do? We chose birch trees to tap. We tapped birch trees. We put a funnel there and under the funnel we placed little pails to catch the birch sap. kapê-kîsik kî-ohcikawin waskwayâpoy. ᑖᓂᐢᐲ ᐃᐢᑯ ᐁᑯᓯ ᑳ ᐃᑕᐦᑲᒥᑭᓯᔭᐣ? ᑲᐯ ᑮᓯᐠ ᑮ ᐅᐦᒋᑲᐏᐣ ᐘᐢᑿᔮᐳᕀ᙮ For how long did you do that? The birch sap dripped all day. kihtwâm kâ-kîkisêpâyak nikâwiy êkwa nimisak kî-kisâkamisamwak waskwayâpoy ê-kî-sîwâkamisikêcik. ᑖᓂᓯ ᑳ ᑮ ᐊᔭᑎ ᐃᑕᐦᑲᒥᑲᕽ ᐁᑿ ᑖᓂᐢᐲᕽ? ᑭᐦᑤᒼ ᑳ ᑮᑭᓭᐹᔭᐠ ᓂᑳᐏᕀ ᐁᑿ ᓂᒥᓴᐠ ᑮ ᑭᓵᑲᒥᓴᒷᐠ ᐘᐢᑿᔮᐳᕀ ᐁ ᑮ ᓰᐚᑲᒥᓯᑫᒋᐠ᙮ What happened then and when? The next morning my mother and older sisters boiled the birch sap making birch syrup. âha, wihkasin sîwâkamisikan. ᐏᐦᑲᓯᐣ ᒌ ᓰᐚᑲᒥᓯᑲᐣ? ᐋᐦᐊ, ᐏᐦᑲᓯᐣ ᓰᐚᑲᒥᓯᑲᐣ᙮ Is the birch syrup tasty? Yes, the birch syrup tastes good. âha, niwihkistên sîwâkamisikan ta-aspahcikiyân napaki-pâhkwêsikanisihk. ᑭᐏᐦᑭᐢᑌᐣ ᒌ ᓰᐚᑲᒥᓯᑲᐣ? ᐋᐦᐊ, ᓂᐏᐦᑭᐢᑌᐣ ᓰᐚᑲᒥᓯᑲᐣ ᑕ ᐊᐢᐸᐦᒋᑭᔮᐣ ᓇᐸᑭ ᐹᐦᑵᓯᑲᓂᓯᕽ᙮ Do you like the taste of birch syrup? Q: ninistohtên kihciniskihk, namahciniskihk, taskamihk… kîkway ôma êkwa? A: [lips contorting in disgust]: nama kîway! ê-atohoyân awa ôcêw. Q: ᓂᓂᐢᑐᐦᑌᐣ ᑭᐦᒋᓂᐢᑭᕽ, ᓇᒪᐦᒋᓂᐢᑭᕽ, ᑕᐢᑲᒥᕽ᙮.. ᑮᑿᕀ ᐆᒪ ᐁᑿ? Q: I understand ‘right,’ ‘left,’ way over there’ … What is that? A: [lips contorting in disgust]: Nothing. I swallowed a fly. The Cree language may disappear before arguments about spelling come to an end, but here, for the record, is the text of a 2011 presentation given in Winnipeg by Ken Paupanekis & Arden Ogg. Ken Paupanekis is a Native speaker of Swampy Cree (n-dialect) from Norway House, who has had a long career in education. Ken currently teaches Cree at the University of Manitoba, and for University College of the North. Arden Ogg is Director of the Cree Literacy Network, and has worked with Cree language in writing following the direction of the late Dr Freda Ahenakew for almost 40 years. Every effort to read and write Cree is important. The knowledge of fluent first-language speakers is incredibly precious. But while spoken language is learned naturally, spelling is a code that needs to be taught. And code has to be consistent if it is to be decoded. In this presentation, we use the idea of “alphabet soup” not to show disrespect for any other writing, but rather, to describe the effect on readers of struggling with inconsistent spelling. The Cree Literacy Network was founded to encourage the development of Cree language literacy materials to support language revitalization. We use SRO because it has been used and tested and taught for over 40 years (and for a bunch more reasons listed in the presentation below). Wayne Jackson encourages people to use it in his FaceBook Group Nêhiyawêwin (Cree) Word/Phrase of the Day. Our purpose is not to discourage or criticize speakers learning to write for themselves. We definitely don’t want to change the way anyone speaks. Rather, Ken Paupanekis and I intended – through this presentation – to highlight the benefit of standard spelling as a key tool for literacy so people can share their language more effectively. For reading fluency and comprehension, Cree speakers deserve consistent spelling. Learning to read and write in your own language should be a fundamental human right, yet relatively few Cree speakers ever have that chance. Those who do learn, struggle with a shortage of readable material, and ever-changing spelling. English had the same problems 500 years ago. We might think of made-up spelling (in any language) as “Alphabet Soup”. It takes a long time for any oral language to become a fully written language. Arguments can go on for centuries about the best symbols to use, whose dialect is “right”, and what spelling works the best. It’s a little like whose auntie makes the best soup. The problem is, any set of symbols will work, every dialect is as good as every other dialect, and actual spelling isn’t nearly as important as consistency. Everybody’s auntie can make great soup! about its crazy spelling, but it works because it is consistent, and they are used to it. Since there is no “right” answer, the only way forward is to pick one system and use it all the time. If we want Cree language literacy to spread in a meaningful way as a healthy part of its revitalization, standard spelling is essential. As an endangered language, Cree hasn’t got centuries to waste! Reading is our most important tool for lifelong learning. As a bonus, current reading theory tells us that biliteracy – the ability to read in more than one language – permits literacy skills used in one language to transfer to the other – especially when both languages use the same symbols (even when the symbols represent different sounds). This means that learning to read and write in Cree can help people learning to read and write in English, and vice versa. But for Cree – as for English – when speakers and teachers write in alphabet soup), most of these benefits get washed down the drain. Once we can read fluently (in any language), wonderful things happen in our brains. Instead of using all of our “working memory” to puzzle out one sound at a time, our eyes begin to grab whole groups of letters at once, helping us recognize the common clumps as words. Faster conversion of words to understanding lets us shift to a higher gear. When we can read faster, we understand better. We can pay attention to what the words mean together in a sentence or paragraph, instead of puzzling over how they sound. 1, Text and Student Handbook (First Nations University, 2011). Myth 1: If you speak it, you can teach it. Fact: Having a body doesn’t make us doctors, owning a car doesn’t make us mechanics. Speaking a language doesn’t make us language teachers. Teachers of any subject need to know their subject matter, but they must also know how to teach. For teaching language, and for teaching reading, teachers need proper training to develop teaching skills. Myth 2: We need to stop language change. Fact: Healthy, living languages never stop changing and innovating. The only languages that aren’t changing right now are the ones that nobody speaks any more. Myth 3: Syllabics can fix all these problems. Fact: Syllabics may be easier for beginning readers to pick up. Certainly it doesn’t hurt that the words are 50% shorter! But consistency is just as important in syllabics as in SRO. “Syllabic Soup” – with spelling made up on the spot – is just as hard to read as the kind with alphabet noodles. Syllabics is also more difficult to manage with computers and smartphones. Myth 4: Standard spelling will destroy dialect diversity. used standard spelling for centuries. For example, in England, the word “conservatory” might be pronounced with four syllables: [kon-SERV-a-tree], where in North America we are more like to say it with five: [kon-SER-va-to-ree]. In China, the distinction between the symbols and the word goes even farther. The same symbols are used for reading three different Chinese languages: Mandarin, Cantonese and Hokkien whose words don’t even sound alike. Myth 5: SRO can’t show dialect difference. Fact: Standard spelling can help readers to recognize and analyse dialect differences for themselves, and to understand alternative words despite the differences. In the words of one elder on Facebook: “I don’t want to change how you speak, I just want to be able to understand you.” A Standard spelling system is the best way to support this goal. As one example, something as simple as bolding the “changing” sound may remind readers that this sound differs from one dialect to another. Some people also add a mark (like the “hats” or “roofs” over vowels) over the “changing” sound. Readers who understand this can easily substitute the sound that is correct in their dialect, and keep right on reading. Myth 6: Words should look like they sound. Fact: Sometimes we forget that symbols on a piece of paper don’t actually make any sound at all. All languages were spoken before they were written, and their sounds exist whether they are written or not. It’s only through reading that we associate those symbols with the sounds of a particular language. The roman alphabet has been used for centuries to write many different languages, with very different sounds. Myth 7: There are no materials. Fact: There is actually quite a lot of material “out there,” but much of it is so idiosyncratic that it can’t be used outside the classroom where it was created, which is really a shame. As long as every teacher has to reinvent the wheel, we won’t gain much from their collective effort. When spelling is standardized, sharing materials is much easier, and the collection of materials will grow much faster. SRO has been in use by Cree speakers, teachers and linguists since the 1970s. The foundation built by those materials is solid and tested: SRO materials are currently used in universities and colleges, and in some school classrooms, across Western Canada. How can SRO help with Cree language literacy? • Books written in different dialects would be readable by speakers of different dialects. • The library of good books to read and other teaching resources would grow faster. • Speakers and readers wouldn’t need special software to type Cree on a computer. • Speakers and readers could use Cree to text on smart phones! • People who can already read English get a head start, already knowing the letters. 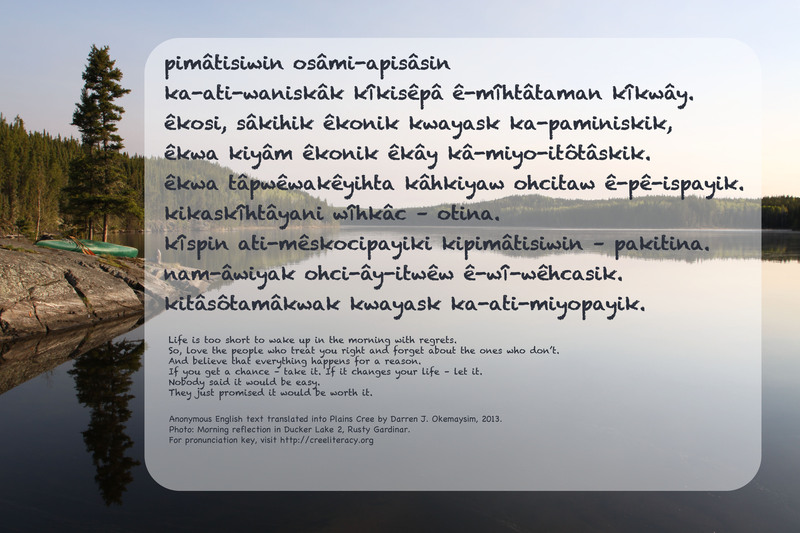 • People who can read Cree now can read more fluently, and with greater comprehension when the words look the same way every time. • Recent reading theory also suggests that reading in any language enhances the ability to read in another language: reading Cree may actually help develop English reading skills, and vice versa. kiyâm pêyak itwêwin kaskihtâyani tâpitaw. even if you’re only able to use one word continually. Thank you, Wayne Jackson for permission to share this from your June 2018 FaceBook post. Sorry it’s taken so long to get here in this form: thank you for persevering! But we still remember Wisahkecahk. They made us see through the wrong. To follow our ancestors in story and song. Thanks to Chief Billy Joe for letting us share his words – and to Solomon Ratt for providing the audio. Billy Joe Laboucan and his four beautiful daughters: Maria Meequon Charity Laboucan Melina Laboucan-Massimo and the late Bella Laboucan; his two sons are missing from this photo. Thanks to Chief Billy Joe for letting us share this poem (that really ought to be a love song). Maybe a tune will come to him some time soon. And thanks to Solomon Ratt for recording his reading of Billy Joe’s work. I know I wasn’t there As you grew up.